After about a month of keeping my excitement under wraps, I can finally say it! I, Flapper Choo, am an influencer for Sony's impressive new 4K Action Cam FDR-X1000V. 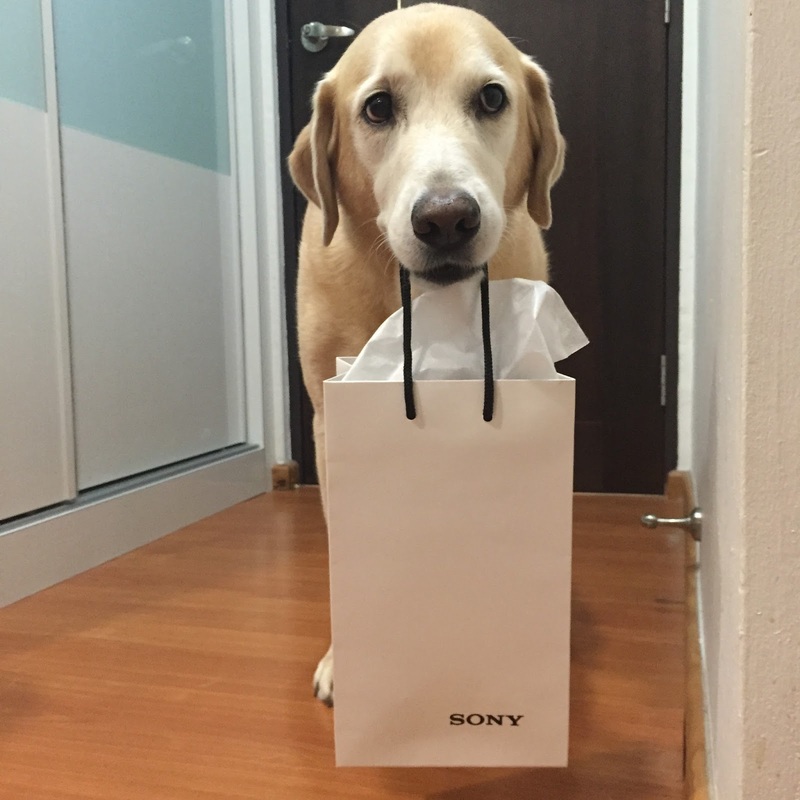 I, Mr Big Blondie, am going to be part of Sony's 'Prove Yourself: Take Your Adventures to New Heights' campaign. I will be going on new adventures for the next 3 months and taking videos of my adventures with MY VERY OWN Action Cam. Am I lucky boy or what?!?! Just about two weeks before I was approached to be part of this campaign, mummy was looking at my charmingly aging-white face and thinking about how routine/mundane my life has been lately. Mummy said to me, "Flapper, maybe we should go create some new adventures, document it and end it off with a nice birthday bash for you. You deserve a great birthday celebration this year.... "
You see, the last time mummy threw me a birthday was when I was four. Since then, my birthday party did not happen for some reason or another. So mummy was quietly hoping and wishing something good would happen for me this year. Mummy would daydream now and again about her adventure idea but did not really get around to making big plans. Then we received THAT email. "On behalf of Sony, we would like to invite Flapper and you to be part of Sony’s ‘Prove Yourself: Take Your Adventures to New Heights’ campaign to promote our newest Action Cam!" Coincidence? Serendipity? Cosmic stars aligning? Whatever this was, the timing was just perfect. The campaign is set to run for 3 months(-ish) which means the last video would tie in perfectly with my birthday. The perfect motivation for mummy to get my new adventures going and CONFESSION! Mummy has always wanted a point-of-view (POV) camera but she could never bring herself to buy one. She wanted to put a POV camera on me to understand my perspective and perhaps better understand my rocket scientist brain. Finding out that I was getting my very own Action Cam with selected accessories plus the much-needed/wanted adventures, mummy and I agreed. We had to say yes to being a part of this campaign. Mummy went for a meeting with Sony and came with this... FOR ME! "Mummy, when do I get to play with my new toy?" Apart from the wonderful-sounding features of the Action Cam, the fact that it came with waterproof casing and live-view remote won me over straightaway. After all, swimming IS a big part of Flapper's life! I was not prepared to use my "choose three accessories" quota on getting a waterproof casing. I am no professional photographer. I am just a regular end-user. I am a LAZY user. I want an easy-to-use portable POV camera. I am admittedly a gadget-dinosaur now. One of my big test was the "user-friendly" level of this camera. And by user-friendly, I mean I did not have to refer to the "cheat sheet" or google the "how to". I like no-brainer gadgets for newbies. I could press the record button, no problem. But the blah-blah settings? Now that... I struggled. I ended up seeking help from the given cheat-sheet and my oh-so-reliable google search. But after the initial struggles with the settings and configurations (does not help that up till now I cannot remember where to change what setting within the cam), I think I am operating the Action Cam decently. At least I managed to take videos without catastrophes. 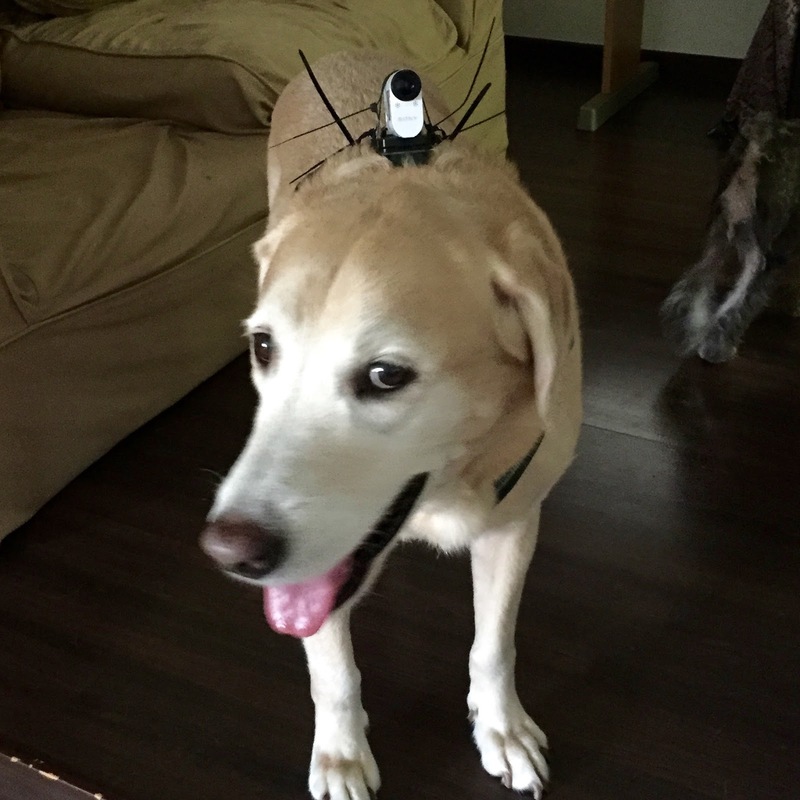 The first test I did was to mount the camera on Flapper. I received the dog mount harness much later so hail to cable ties! I decided to take out my dusty rollerblades and have some fun with the boys. Well, human embarrassing moment. I am so slow on blades, the boys were STROLLING next to me. And here's the other thing about me on blades.... Flapper knows how lousy I am on blades and that he is my ever-trustworthy "brakes" (I hang on to him for my dear life when I need to stop). He makes sure he stays close to me. The only time you will see Flapper get anxious is when I get on wheels - roller blades or bicycle. Funny and embarrassing all in one. We are very fortunate that Flapper's photographer aka sleep buddy, Uncle Nic of Furry Photos Pet Photography, has agreed to join us for this journey. So we made a swim date with Nic to do THE swim Action Cam test. But to up the game, I decided to see if I can get Flapper to stick his head underwater. Shot of the day! Still shot taken with the Sony Action Cam. again once we get the flat dive-door lens. After having oodles of fun testing the Action Cam now, it was time to get down to serious business. I need to put my first video together. Mummy said it is MY project so I need do my own presentation. 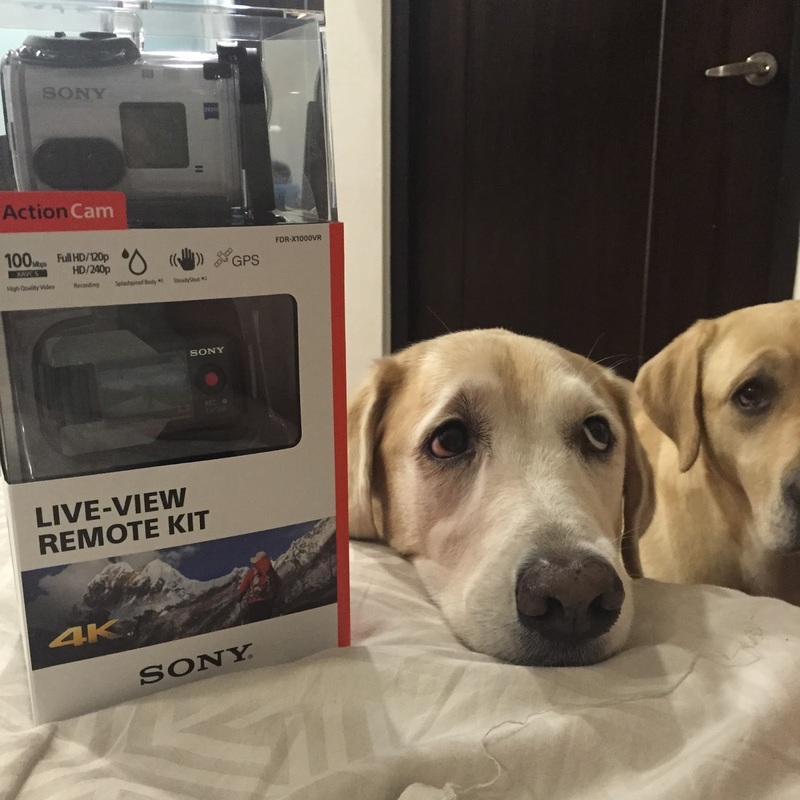 Here is my first video for Sony's "Prove Yourself: Take Your Adventures to New Heights"
Stay tuned to read more/follow my journey as I share more about my experience with the Action Cam, my personal thoughts and to see more videos of my new adventures using my awesome Action Cam! Writer, social butterfly, toy tester, product tester, food extraodinaire and a whole lot of et cetera. I love my life. I love my job. And my life begins again at 10. The Sony XPERIAnce Continues (Part 2) - Of 3D Scanning And Getting ABIT Geeky With It. Friends will be Friends.... Always there for you. Wubba! Wubba! It's Time To Tugga!